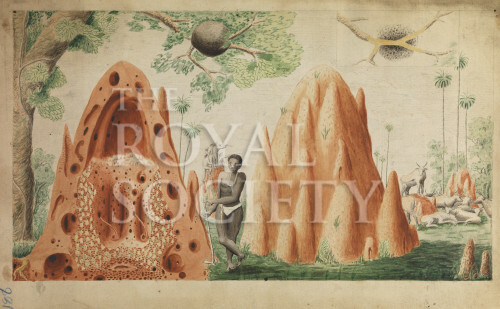 Plate 7 from the paper “Some account of the termites, which are found in Africa and other hot climates”, Philosophical Transactions of the Royal Society vol.71 part 1 1781 pp.139-192. Showing one intact and one sectioned termite hill, with an African worker between, apparently having just broken into the damaged colony, to indicate scale. Structural details include the turrets, royal chamber and nurseries. Behind, a group of five Europeans are shown climbing a termite hill with telescope, demonstrating its use as observational platforms “seemingly observing a vessel at sea”. A herd of cattle appears to the right of the work with a bull standing sentinel on a termite mound. Behind are African palm trees. Above the main hills and attached to a tree branch is a termite arborium, reached by covered passageways extending up the trunk of the tree. The arborium is shown in section on the upper right of the painting. Not signed.